How Does Ethylene Affect Ripening Fruit and Vegetables? Once cut, fresh vegetables, fruits, flowers and plants produce ethylene gas as they age. If allowed to accumulate, the ethylene further accelerates the aging process. Continuous or intermittent use of appropriate levels of activated oxygen in refrigerated spaces has shown to be effective in reducing the rate of plant and produce aging by destroying ethylene gas without producing any negative side effects on the product, thus reducing food spoilage and decay and extending the quality and shelf life of most produce. The BerryBreeze Refrigerator Sanitizer delays molding and decay of many foods you buy including fruits and vegetables helping them retain their freshness and flavor longer. The average household throws away 150 pounds of produce every year, due to spoiling before use. The BerryBreeze Refrigerator Sanitizer could save your family $300 during the first year, alone, more than four times the purchase price! The BerryBreeze Refrigerator Sanitizer runs on four "D" batteries (not included). 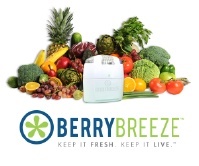 The BerryBreeze Refrigerator Sanitizer significantly reduces the bacterial and fungal loads in the air and on surfaces where plants, flowers and produce are stored, creating the sanitary environment needed to dramatically enhance product quality, improve product longevity, reduce spoilage and extend shelf life. 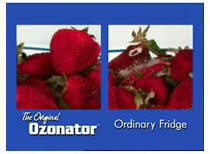 The BerryBreeze Refrigerator Sanitizer eradicates odors in your refrigerator caused by many foods, including leftovers. "Our refrigerator at the office doesn't stink anymore. It's a miracle!" BerryBreeze Refrigerator Sanitizer is engineered for the harsh conditions of cold with high levels of humidity and are ideal for use in refrigerators. These units will dramatically improve hygienic conditions by significantly reducing the level of biological contaminants, including bacteria, viruses and mold, and are effective in neutralizing unpleasant odors and eliminating odor transference between products. It requires four (4) ''D'' batteries and the dimensions are 5'' Wide x 5.25'' High x 2.5'' Deep. The unit treats 16 cubic feet. The BerryBreeze Refrigerator Sanitizer promotes a clean environment inside your refrigerator. When produced in sufficient quantities, ozone is known to oxidize, and, thereby, destroy many harmful germs and bacteria, molds, and yeast that may cause infection or incidents of disease and illnesses that can be transmitted from one family member to another by hand contact on foods, food containers and other hard surfaces inside your refrigerator. "It's so simple! Like having a maid in the fridge. I just put it on the top shelf and there it sits, working all by itself! " Step 1: Open the box and remove your BerryBreeze Refrigerator Sanitizer from the Styrofoam shield and its protective plastic covering. Step 2: Press both tabs on the sides of the BerryBreeze Refrigerator Sanitizer at the same time to separate the top half of the BerryBreeze Refrigerator Sanitizer from the lower half (battery compartment). Insert four (4) "D" size batteries properly into the lower-battery compartment of the BerryBreeze Refrigerator Sanitizer (batteries not included). Step 3: Firmly reattach the lower half of the BerryBreeze Refrigerator Sanitizer to the top half. Once the two halves are securely attached, the light on the front of the BerryBreeze Refrigerator Sanitizer will turn solid green, indicating the BerryBreeze Refrigerator Sanitizer is activated and working properly. Step 4: Place the BerryBreeze Refrigerator Sanitizer on the top shelf inside your refrigerator. Do not remove the BerryBreeze Refrigerator Sanitizer from your refrigerator during operation, except to replace the batteries. How Safe Is Activated oxygen? In 1997 the FDA deemed that activated oxygen was generally recognized as safe as a disinfectant for foods. It can be used to increase crop yield, protect foods during storage and transit, and for general sanitizing purposes. The National Organic Standards Board also allows activated oxygen use for processing. According to the National Food Processors Association, activated oxygen is very efficient in killing pathogens and spoilage organisms, and its use by the food industry will be welcomed as another tool to ensure the production of safe and wholesome foods. The USDA says activated oxygen can be applied to sanitize and can also help prevent spoilage during shipping. D.M. Graham, Ph.D. - Dr. Graham pioneered the application of activated oxygen as an antimicrobial agent in food processing, and chaired a national panel of food safety experts in 1997, resulting in GRAS (Generally Accepted As Safe) affirmation of activated oxygen for use in food processing. This was followed by a Food Additive Petition (FAP)presented to the Food and Drug Administration (FDA) in 2000, and approved in 2001. Rip G. Rice, Ph.D. - Dr. Rice served as an information resource to the Electric Power Research Institute ("EPRI") panel of experts that declared activated oxygen to be GRAS for direct contact with foods in June of 1997. Later, the EPRI commissioned Dr. Rice to write a Food Additive Petition (FAP) requesting FDA approval of activated oxygen as an antimicrobial agent for direct contact with foods. That FAP was submitted in August 2000 and was approved by the FDA in 2001. An independent study proved the BerryBreeze Refrigerator Sanitizer is "very effective" in eliminating strong food odors and protecting storage life of strawberries and other produce. 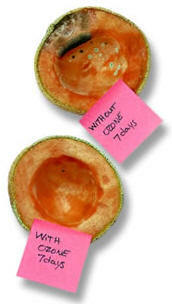 The shelf life of cut cantaloupe was more than doubled by storage with the BerryBreeze Refrigerator Sanitizer. According to an independent study, conducted by R & D Enterprises of Walnut Creek, CA, a leading laboratory for activated oxygen research, refrigerator odor elimination by the BerryBreeze Refrigerator Sanitizer is "very effective" even for foods such as unwrapped gorgonzola cheese, unwrapped onions, fresh crushed garlic, cooked cabbage and four-day old raw chicken parts. This claim is well supported by data from a ten-member professional panel. All ten panelists rated the BerryBreeze Refrigerator Sanitizer test refrigerator as having essentially "no food odors", while a normal fridge with the same contents was characterized as having "strong food odors". The same study showed that produce such as fresh strawberries were much improved by storage with activated oxygen. Molding was prominent in the control berries, while the BerryBreeze Refrigerator Sanitizer-protected berries still looked fresh and wholesome after storage for eight (8) days. In addition, the shelf life of cut cantaloupe was more than doubled by storage with the BerryBreeze Refrigerator Sanitizer. Celery stalks remained firm much better with activated oxygen; the improvement compared to storage in a non-BerryBreeze Refrigerator Sanitizer fridge was "very noticeable".